One electronically tested 925 silver ladies cast & assembled blue topaz and white sapphire pendant with chain. 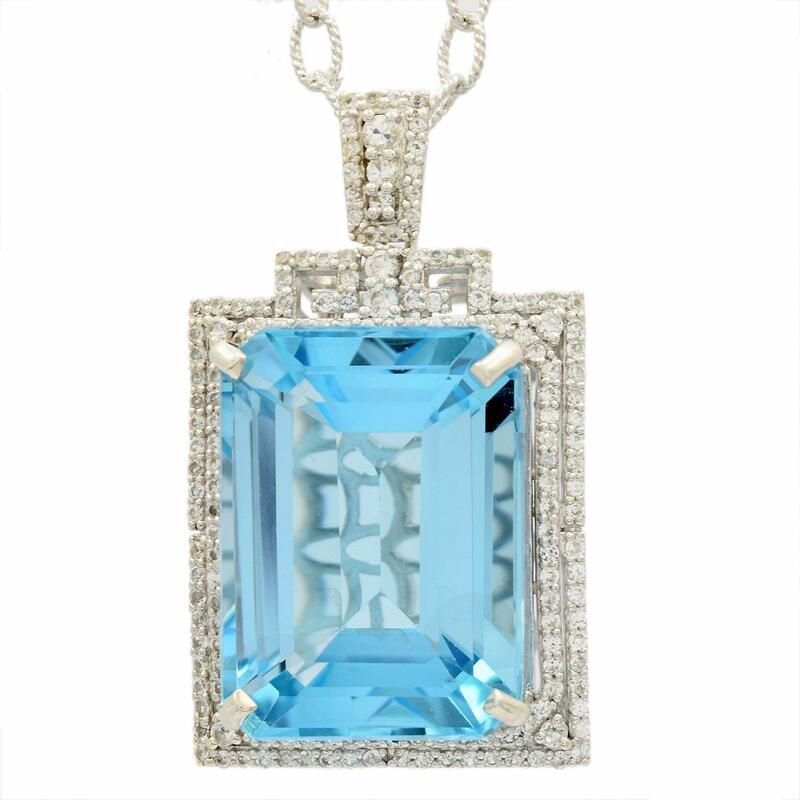 The pendant features a blue topaz set within a white sapphire frame, completed by a white sapphire set bail. The pendant is supported by an eighteen inch length 925 silver designer style chain, terminating in a lobster claw clasp. Bright polish finish. Trademark is Orianne. Identified with markings of "925". Condition is new, good workmanship. One prong set rectangular step cut natural blue topaz approximate weight of 63.09ct., clarity is eye clean, type I, medium, very slightly grayish, very slightly greenish blue color, (GIA vslgB 5/3), cut is good. Transmitting light with no distortion, transparent. Graded in the setting. One hundred sixty-seven prong set round mixed cut natural white sapphires approximate total weight of 2.33ct., clarity is eye clean, colorless, very slightly grayish, white color, (GIA W 0/3), cut is good. Transmitting light with no distortion, transparent. Color grade is an average for the group. Graded in the setting.